I dreamed about Ron Swanson last night. No, we weren’t enjoying bacon-wrapped turkey legs or the “Four Horsemeals of the Eggporkalypse,” and no, he wasn’t stealing my wife with the power of his mustache. As with all my dreams, I remember only snippets and fleeting moments, but as I recall, I was observing this dream scenario rather than being involved. All the main Parks and Rec characters had congregated at Ron’s house, and it was the middle of the night. There was an attack of some sort, and Ron woke up to the noise of explosions and tumult. And then his bedroom sealed itself off and became a sort of “panic room,” and Ron couldn’t get out. Presumably Ron knew how to escape his own panic room and did so eventually, but my memories of the dream end with Ron raging at the thought of being unable, because of his own hyperactive instinct toward self-preservation, to help his friends and co-workers when they needed him. Among TV shows that are still producing new episodes, Parks and Recreation is my favorite comedy and probably my favorite show overall. I’ve written before about how much I appreciate the show’s internal consistency, its ability to portray nuanced interpersonal relationships other than romance, its mostly well-rounded, well-developed characters, and its inventive Web-only material. Let’s not forget that we’re talking about comedy here as well, and the core writing of Parks and Rec is solidly, reliably funny. Those are reasons why I enjoy the hell out of Parks and Rec, but they don’t quite get at why I feel a deep, abiding affection for the show, why I felt a big absence when NBC didn’t air it in the fall of 2010, and why I feel like something actually important would be lost if Parks and Rec weren’t given room and time to keep growing and exploring the great niche it has carved out for itself. Now that some critical mojo is building and it’s got a nice, cushy time slot (on an NBC scale, at least), I’m less concerned about early cancellation, but I still feel a protective instinct toward this odd little show. Back to that dream, which I led off with because A) it really was just last night, and B) it’s rooted in the idea I’ve had since late in Season 2 that Parks and Rec presents a pro-civic perspective that is exceedingly rare on TV, if you can find it all. I see in the show a “quiet ideology” relating to the essential functions of government that, from my perspective, should be a given in American political discourse, and perhaps once was. But that shared assumption of “like it or not, we’re all in this together” has been abandoned as our politics have shifted and the American ideal of individualism has been distorted such that the word has, in our political discourse, come to connote naked selfishness and lack of sympathy for the concerns of others. "The Swanson." This is not a man who shares. 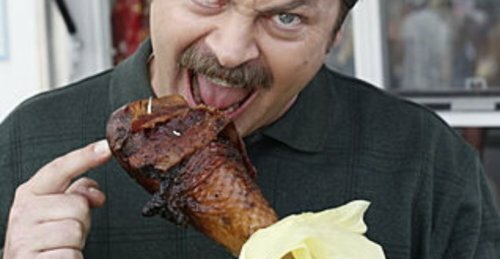 In my dream, Ron Swanson, nothing if not the show’s avatar for “rugged American individualism” and the beauty of the liberty to eat as much meat as you can shove down your gullet, wanted to help others when the chips were down but was delayed from doing so because of previous measures he had taken to protect himself and himself only. I think we also see this conflict in the show itself. Despite his belief that government is wasteful and unnecessary at best, evil at worst, Ron carries a deep admiration for Leslie Knope because he knows that some minimal level of civic organization must be maintained, and he sees that Leslie can do what must be done even when everyone around her is incompetent (Ron included) and her budgets have been bled dry. Such is Ron’s belief in Leslie that he refuses to cut her position even when given the opportunity to do so. If it were that simple—“Ron is a libertarian, but deep down he’s starting to see that government is good” or something like that—then Parks and Rec would be far less interesting than it actually is. Complicating matters is the fact that there seem to be far more Ron Swansons than Leslie Knopes in the Pawnee city government. There are far more people who just want a paycheck and a pension than people who give a damn and are actually working hard to make their town better (or at least keep it from declining). And most of the citizens of Pawnee, generally and very effectively presented for laughs, don’t inspire much confidence either. It’s not easy to believe in the value of community when the members of that community are dysfunctional, disengaged, and uncritical. They’re the folks who bemoan the closing of the city parks because of spending cuts but also cry out in rage when hearing the idea that taxes might need to be raised to avoid cutting the parks department. These dots seem to go forever unconnected in the minds of the Pawnee townsfolk. Because of its blatant pandering and the laziness of the “thinking” behind it, perhaps my least favorite bit of common political rhetoric these days is, “The American people know how to spend their money better than the government does.” I can’t stand that blithe, mindless wordplay because it undermines, and sanctions utter abandonment of, the values of community. Said another way, if you know that your neighbors are all going to pool a bit of their money to provide basic services all of you need (security, maintenance, shared space, etc. ), then you’ll see that as a good investment to make as well, and you’ll gladly make it. But if you don’t trust your neighbors to do what you’re doing, if you’ve been convinced that you’re actually subsidizing others who aren’t paying their own way, you’ll pay your share only begrudgingly and you’ll constantly be looking for ways to reduce or eliminate your contribution. In our politics today, I hear far more messages that reinforce the latter vision rather than the former. It often seems we’re headed toward wide swaths of the population simply rejecting the idea that they should help pay for any societal-level needs because they’ve come to believe that most other people don’t pay their fair share anyway. An extra layer of dysfunction creeps in when most citizens, even those who don’t wish to pay, still hope and expect deep down to benefit from those public services when they need them. We all know the phrase, “Government is a necessary evil,” but certain segments of the political spectrum seem to actually believe only the “evil” part these days. But I think Parks and Recreation gives at least a fair hearing to the basic, and formerly widely held, idea that “necessary” should be in there somewhere too. That Parks and Recreation mitigates its “importance of government” ideology with a dose of clear-eyed realism makes its quiet presentation of that ideology all the more valuable. Yes, some government employees are incompetent. Yes, your neighbors might well be kinda dumb and couldn’t critically think their way out of a paper bag. And yes, in many areas, you know how to spend your money ”better than the government does.” But Parks and Rec reminds us that nearly all citizens, except the fabulously wealthy, simply cannot spend their money to create and maintain a park for their children to play in, unless everybody else also kicks in a bit. Same goes for public safety, and schools, and other community needs. For me, Parks and Rec goes from being merely “good” to “important” because of its quiet way of showing that we’re citizens and community members whether we like it or not. Pretending otherwise helps no one—ultimately, not even yourself or your loved ones. Goddamn. I wish I could write like this. That’s nice of you to say, Paul, but you can and do.